The United States is pressing European allies to ready more Nato troops, ships and planes for combat in a fresh move to shore up the alliance's deterrence against a potential Russian attack. 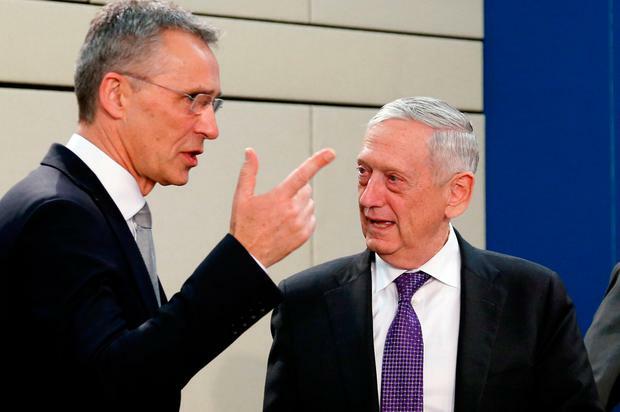 US Secretary of Defence Jim Mattis will seek broad agreement for the plan in Brussels tomorrow when defence ministers meet, laying the ground for endorsement by Nato leaders in July, officials said. The plan would require Nato to have 30 land battalions, 30 air fighter squadrons and 30 navy ships such as destroyers ready to deploy within 30 days of being put on alert. It does not discuss specific troop numbers or a deadline for setting up the strategy. The size of battalions varies across Nato, from 600 to 1,000 soldiers. This lays down a challenge for European governments, pilloried by President Donald Trump for slashing military spending after the Cold War, to remedy long-running problems with helicopters and jets that are grounded for lack of parts. "We have an adversary (Russia) that can move quickly into the Baltics and Poland in a ground attack," said one senior Nato diplomat who was briefed on the US plans. "We don't have the luxury of taking months to mobilise," the diplomat said, saying the US idea was known as 30-30-30-30. One US official said the initiative was primarily aimed at countering Russia and fitted with the Pentagon's 2018 National Defence Strategy, which accuses Moscow of seeking to "shatter the North Atlantic Treaty Organisation". Russia's war games last year, involving an estimated 100,000 troops, also prompted concerns about accidental conflicts that could be triggered by such exercises, or any incursions into Russian-speaking regions in the Baltics. Wrong-footed by Moscow with Russia's seizure of Crimea in 2014 and its intervention in Syria's war in 2015, the US is distrustful of the Kremlin's public message and wants to be ready for any eventuality. With more than two million troops, Nato's forces outnumber those of Russia, whose active duty members are around 830,000, according to the International Institute of Strategic Studies, a British-based military think-tank. Russia's annexation of Crimea prompted Nato to set up a small, rapid-reaction "spearhead" force and put four battalions in the Baltics and Poland, backed up by American troops and equipment. But it is unclear how fast the alliance could move large troop numbers to its eastern flank and how long it could sustain them for, with France already stretched in Africa and British cutbacks reducing the size of deployable forces, officials said. Another unknown is how the 30-30-30-30 proposal would fit in with other initiatives which are aimed at improving European military combat readiness and to address shortfalls in weaponry and other military assets. The European Union last December launched a defence pact to develop crisis-response forces and work together to develop new helicopters and ships. French President Emmanuel Macron aims to set up a new French-led European "intervention force".